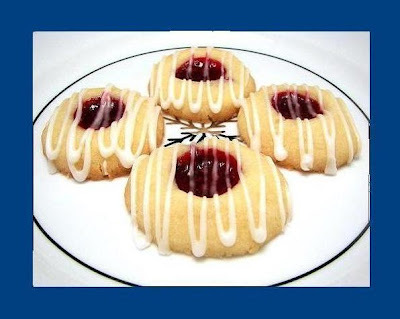 These thumbprint cookies are so named because you literally use your thumb (or finger) to make an indentation in a ball of cookie dough and then fill it up with jam or preserves. There are probably a gazillion recipes for thumbprint cookies, but this one is way high on my list. They're super tasty and the red jam makes your tray of cookies look all the more festive. Don't like raspberry? Choose another kind of jam! Try using blueberry, strawberry, apricot or pineapple preserves or even lemon curd. No matter what flavor you choose, they'll be scrumpdillyicious! In a medium bowl, cream together butter and white sugar until smooth. Mix in 1/2 teaspoon almond extract. Mix in flour until dough comes together. Roll dough into 1 1/2 inch balls, and place on ungreased cookie sheets. Using a thumb or finger, make a small hole or "thumbprint" in the center of each ball and fill the hole with 1/4 tsp of the preserves. Bake for 15 to 18 minutes in preheated oven, or until lightly browned. Let cool 1 minute on the cookie sheet. In a medium bowl, mix together the confectioners' sugar, 3/4 teaspoon almond extract, and milk until smooth. Drizzle lightly over warm cookies. The thing that makes this cookie is the almond glaze. Yes, they taste wonderful without it, but the glaze puts it over the top! I'm definitly going to try these! They look incredible!